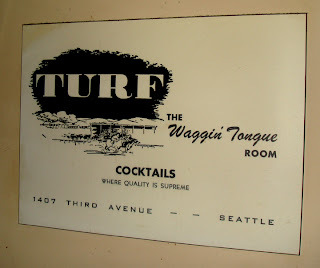 Most people think of Turf as the greasy hangout of bums, drunks and the down-on-their-luck -- the people on the surrounding streets that lead white collar people in nearby offices like mine to know local businesses by nicknames like "Creepy Coffee" and "Scary Teriyaki." And so it is to a pretty fair degree. But the Turf Lounge is an honest bar, and makes no apologies for it's age -- as evidenced by the two massive Smokeeters® that still dominate the small space -- and no apologies for its clientelle -- as evidenced by the two ladies chuckling at the man lying supine on the sidewalk across the street (a fellow who seemed to be familiar to them). It's tiny, with small versions of all the standard dive bar features -- one small pull tabs bin, one game screen, one TV -- and I like it. I'm not ready to give it my "great dive bar" rating, but I'll probably be back a few times and the right combination of clientele could lead me to change my mind. 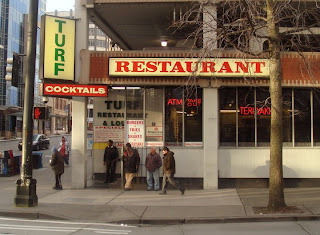 Historical notes: The Turf Smoke Shop Restaurant, featuring the Waggin Tongue Tavern, was at 1407 3rd Ave since at least 1948, and moved to 107 Pike in 1988 (a space that later became "Johnny Rockets"). 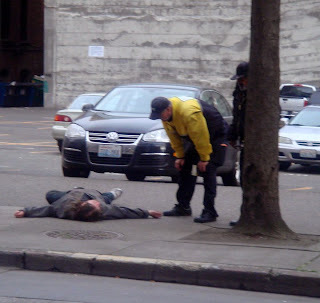 It moved to this last location at 2nd and Pike at some time in the early 2000s. "For decades the diner and bar has been a sort of one-stop shop and service center for downtown's poor, its pensioners, odd-jobbers and welfare recipients. Here they could get their benefits or temporary labor checks cashed, without having to mess around with the banks." (Danny Westneat) More history can be found at this homage to owner Pat Altshuler. Is it really called the "waggin' tongue?" room? Mike Seely has the Turf on his top 10 most intimidating dive bars. The Waggin' Tongue Room was in the previous (larger) location on 3rd Ave.